"White Cup with Blue Stripes"
I did this painting last week. There are too much things going on so I did not get a chance to post it timely. It seems my daily painting practice has moved to a new phase. I have not done any 6" x 6" for several months now, and my comfortability level in dealing with relatively large painting surfaces is increasing steadily. Showing painterly effects on larger canvases is my effort now, and this effort will continue for a while. The visual impact of a larger painting is significantly stronger than that of a small painting, so now I am a more serious painter than before. “Yellow Rose in Blue Vase"
You can see I am practicing the design of my brush work. This is the third painting in this series. Painterly painting style does not happen accidentally. It requires a thoughtful process. I am still in the early stage of my style design. I heard comments like this: so and so's painting is too stylish. It has a feeling of some degree of negativeness in it. It sounds like the painting is developed by following a formula. Personally, I am not against using formulas. When I was doing my scientific research work, I used mathematic formulas all the time. The same principle applies to art as well. However, the issue is how many formulas do you have? If you only have one or two, that is problematic. Moreover, if your formula was not derived by you, in other words, you don't know why but just simply follow the steps, then the painting will be boring. So my "two cents" is: 1). painting from life, 2). summarize your own formulas, and 3). cumulate formulas as many as you can. Am I getting crazier? Am I going too far? Please let me know. I felt pretty good about this painting. Finally I gained some freedom in relatively large paintings. This one is 11" x 14". Painting loose, but can not be sloppy. All the perspective, symmetry, and value need to be correct. Don't you agree? This is my dream direction: I want to paint loose on my large paintings. This one is 12" x 12". If I don't tell you, don't you think it is as loose as one of my small 6" x 6" paintings. This painting is not perfect. It is an experiment, but it does have some of the effects I have been trying to obtain for a long time. To be honest with you. I did not feel confidence when I paint this one. I have to concentrate on the aesthetic designs while to place adequate amount of realistic information to make it representational. It is a balance between the abstract design and convincing realistically. Besides painting and teaching, I feel I have another mission to accomplish. That is to bring top-notch artists come to Austin to share their art and techniques. This painting was done by my friend Nancy Tankersley. I really like her impressionistic figurative work. I am very excited to announce that Nancy will come to Austin in March 2015 and teach a painting workshop entitled "Keeping it Fresh - Painting Figures from Photos". 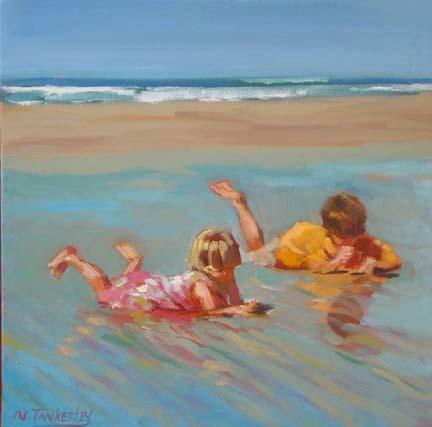 If you are interested in learning Nancy dramatic way of painting, please check: Nancy Tankersley workshop in Austin for detailed information and sign up. You will notice as well that I have a new website. I want to thank Jane Frederick tremendously for developing and managing this new site for me. My old website is still working as well, but eventually my two websites will merge. "Still life with four objects"
I am sorry I give such a lousy title to this painting. I feel I am not sophisticated enough to handle "Zen of something" type of topic. So I start to push my understanding of "Grey" into the background and introduce a few more recognizable colors into this painting. This painting was started as a demo for my Austin mentoring class, then I added a few more things after that. I intend to come out of my grey study for a while and shift the gear to "modeling". How to balance between detail and looseness in the modeling stage is another very important field I want to spend some time on. I don't know how genuine this image showing the painting. It is the worst time taking the photo (3 or 4 days after the painting started). I have so much glare, no matter what to do I can not avoid it. Anyhow it kind of matches the title I give to this painting. Today I have something I feel exciting to share with you: Trailside Galleries has contacted me, and my paintings will be shown in Scottsdale, AZ and Jackson, WY. This is another high prestige gallery after InSight Gallery represents my work. I have spent two days on the painting showing today. I want to keep it painterly as much as possible. It is also another grey dominant work. I don't have enough experience of painting larger paintings. so I will keep working. This is the third demo at Lafayette. My flower painting gets more abstract now. If you zero into any individual roses. you will see they are just several abstract shapes. They don't look like roses at all. My crazy mind starts tickling. Maybe one day in the future, I will paint roses blue and my art has turned into something completely strange and bizarre (but price tag shows a few Ms). Then you may say: "This guy used to know how to paint, I have seen his earlier paintings before". Just kidding. In the evening of the last day of my Lafayette workshop, a group of artist friends and me went dinner at a very famous restaurant in town --- The Blue Dog Cafe. It is a very "artsy" place showing the "Blue Dog" paintings of the famous artist: George Rodrigue. I saw the blue dog painting before. They are ubiquitously distributed on art magazines. Surrounded by various colors of "blue" dogs on the wall, I was pondering about modern art. The friend sitting next to me said: "George Rodrigue did know how to paint, You can see that from his early works". I think I heard similar argument about Picasso's works as well. Artists can do whatever they want to do, and collectors can buy whatever piece of art they want to buy. However, the question is what is people's taste about art. This "taste" will determine which artist will be successful or starving. Picasso and Rodrigue are phenomenal artists, and our taste has determined that the art world goes to dogs. I felt really good about my second demo at the Lafayette workshop. Similar to my "Zen of Grey" painting series, this painting has not much of high chroma colors, but the subtle color change in grey makes the painting have strong feeling of light. I use the metallic objects to demonstrate the way to manipulate the high lights and show the metal texture. This painting shows how effective of using opacity vs. transparency to achieve the light effect. After a very problematic trip, I have arrived at Lafayette, LA. My workshop here started yesterday, and this is my demo painting number 1. I want to thank Lafayette Art Association for organizing, and all the artists from Louisiana and Texas for coming. The blue pot in my demo is an art work of another artist displaying in gallery here at LAA. It gave me a great opportunity of using pthalo blue. I am in the cajun country now, looking forward to some great cajun food.